If eggs had the power to bring happiness than these are the ones that would do it. Another trip to the Providence Wintertime Farmers Market this past Saturday yielded me a tote full of delicious local fair including a dozen breathtaking free-range eggs in every color of the rainbow (slight exaggeration). Why my excitement? You see, we all have our goals and aspirations in life, and included on my list is the dream of having my own flock of heirloom chickens to lay a spectrum of eggs just like these. 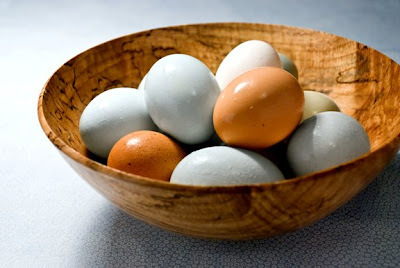 For those of you not familiar with chicken varietals, many kinds of chickens lay white and brown eggs, but there’s only a few species that lay beautiful blue eggs including Araucanas (originating from Chile) and Ameraucanas (breed in the US from Araucanas). These are the hens that I’m most passionate about. But alas, until I acquire a larger piece of land my dreams for raising my own heirloom chickens must be shelved, along with those of a three-season garden and making my own goat cheese. I’m not sure there’s anything that compliments fresh eggs better than fresh asparagus. After nearly 11 months of waiting, yesterday I finally picked up my first bunch of local asparagus from 4-Town Farm in Seekonk. Much like how supermarket tomatoes hardly resemble the plump beauties picked from one's own garden, once you experience freshly picked local asparagus there’s just no comparison to the stuff shipped in from all over the world. Bring a pot of water to a boil. Add a half handful of salt to the water. Add asparagus and boil until tender, approx 3-5 minutes. Immediately submerge the cooked asparagus into a large bowl of cold water. Drain. Make the gremolata: In a small bowl combine the lemon zest, garlic, parsley, and a pinch of salt. Mix very well. In a separate bowl toss the pea greens with the lemon juice and olive oil (optional). To serve: Add a layer of pea greens to two individual plates. 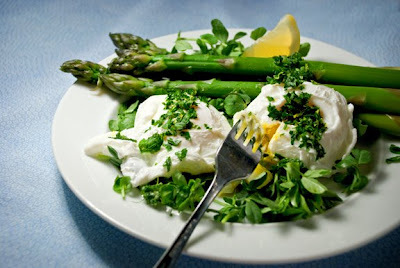 Top the pea greens with a few spears of asparagus and two poached eggs each. Top each egg with a generous sprinkle of gremolata and black pepper. Enjoy! I have to admit that when you told me about your eggs, I wondered "how in the world can she think eggs are beautiful" but now I know! I love how you told the story about your chickens. For anyone that knows you and your love of chickens, it's a great story and I love how you tied the 2 together. The dish looks fabulous! I think I'll go pick up some asparagus. Your healthy habits are rubbing off on me (just don't ever lose your love of chocolate). Hi Sue and SophisticatedBrew! Thanks so much for the comments! Sue - Don't worry, I am totally convinced that real chocolate is super healthy. Dark chocolate is packed with antioxidants and has been proven to reduce cholesterol and lower blood pressure. That's reason enough for me to keep on eating! SophisticatedBrew - Welcome! You definitely have to check out the Wintertime Farmer's Market. You don't have much time, I think it only runs until the end of May. Can I raise some Alpalca's on your farm? Lara - that's a great idea! I'm in!